Posh Party Box is a company that specializes in fun for kids and for those ‘young at heart’. They create themed party packs for kids birthday parties and they have party packs for adult parties and showers as well. If you can dream it up, chances are they have already thought about it and created a party in a box for it. I received the Christmas Cookie Baking Set For One to review. I was completely blown away when I opened up the shipping box it came in. There it was, a big white box wrapped with the biggest bright red bow I have ever seen. Included in the box was everything any junior baker needed to make holiday treats (minus the ingredients). While I went through all of the items included, it reminded me of baking with my mom. Baby Bird’s favorite items in the set are the chef’s hat and the gingerbread apron. The hat fits her perfectly and is so adorable. The apron is made with a soft material. It ties at the neck and around the waist and has a pocket in the front with a gingerbread man sticking out. Baby Bird picked it up and immediately wanted to wear it. She proudly stood still while I adjusted everything, then walked slowly around the room as though she was modeling it. I didn’t get it off her for an hour! My favorite items in the set are the rubber spatula, wooden spoon, rolling pin, metal whisker, cookie spatula and the holiday cookie cutters. The reason I like them so much is because they are the perfect size for Baby Bird. They are smaller than the baking utensils I use and that means that Baby Bird has her very own baking set. Last, but not least, Papa Bird’s favorite part is the end product. We have decided to declare him the official “Taster” for all treats that come out of our kitchen during the holidays. Lucky, lucky man! Also included in the set are measuring spoons, holiday cookie sprinkles and 30 recipe cards. The recipe cards are sturdy and there is one recipe to each card with images and ingredients on the front, and directions on the back. Single cards are perfect if you are baking with a little one. Mistakes happen and this way if a liquid is spilled, then only one recipe is affected, not the whole book. 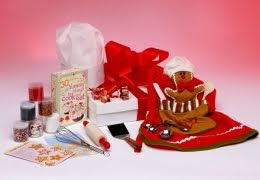 The Christmas Cookie Baking Set For One can be purchased for $59.95 on the Posh Party site. If you get a chance to visit the site, let me know what your favorite item is. I like the Shhhhhh It's a Surprise Birthday Party set. I really liked the New Years Eve Ball Kit.. I like Itza My Pizza party kit. My favorite on the site would be the Butterfly Princess Party. I like the Itz Mah Party pizza. I like the Happy Camper Set! I also like the Lets Play Ball Sports Party set. All Hands In Poker Party, Our whole family loves poker, we even taught our 11 yr olds how to play. Thanks. The Wine and Cheese Party set looks amazing!! I love the All About Bugs Nature Party. I like their canlde holders. Aged To Perfection would be my choice, and since today is my birthday it would be especially nice! I love the Holiday Cheer Party Box. I like the LIl Boy Blue Baby Shower (I'm due with a boy in Feb). I really like the All About Bugs Nature Party box.Thanks! This is seriously cute! I also like the All Aboard train party. I love the Holiday cheer one. I like the pewter carousel candle holders. I love the Glamour Nights Sleepover Party~Beautiful!! I love the Sockadelic Sleepover party items/kit. I just love the site too. It's neat. Thanks for hosting.. I would love to have their Gingerbread apron too. The Sugar 'n Spice Cookie Baking Party looks fabulous…a bit pricey for me, but really great. I like the New Years Eve Ball set. I thought this was a great idea- what I liked was their recipes and party ideas. I love the Wine & cheese party box ! I like the Sugar and Spice Cookie Baking party. I also love the Pineapples in Paradise Luau Party box, thanks! I love the Santa Plate and Mug. Thanks for the contest! aged to perfection would be perfect for my dad's 50th birthday this year. My daughter would love the Butterfly Princess Party. I love the Dinosaur Dig set. The butterfly princess party is my favorite! i like the sugar n' spice! I like the Pomp and Circumstance Graduation Party. They have lots of neat stuff. I like the Kids Butterfly Princess Pack. I love the Wine and Cheese party. I like their happy camper package! My son and daughter would like the Slight of Hand Magic Party. So many darling things! I LOVE the All Hands In Poker Party! Thank you. All About Bugs Nature Party would be a hit with my boys. I love the Princess Tea Set. The Ahoy Mates Pirate Party is too cool. My four year old has a b-day coming up and this is perfect. Think "I Want to Be a Pirate"
I like the ahoy mates pirate party! My 3 year old is totally into pirates right now! I like the slight of hand magic party. My son would love that! I like the Glamour Nights Sleepover Party for Eight, although it may be a little young for my daughter! The dinosaur dig kit would be fun for my son. I would love the Sugar 'n Spice Cookie Baking Party! I like the HOliday Cheer set. I know my nephew would love the Lets Play Ball Sports Party. Thanks! I like the all about bugs nature party. The Holiday Cheer wine box is my favorite-such fun for a get-together! One of my favorite items is the Glamour Nights Sleepover party box. My daughter would have a blast with something like that with her friends. Instead of the normal watch a movie, eat popcorn sleepover, girls can dress up alike, do their hair, and lots more. My favorite item would be the Lets Play Ball Sports Party Set. I think the Holiday Amaryllis Vase looks amazingly beautiful !!!! Cool Stuff!! I'm a fan of the Girl's Night Out game…i'm not one for games..at all! But, the box of questions for just the girls sounds like fun! I like the Sugar & Spice Party. The Queen's Tea Party is beautiful and the intricate designs are very eye-catching and delicate!! I like the Pineapples in Paradise Luau Party. The Happy Camper package would make me very HAPPY. A great idea for a different kind of party. This is an amazing giveaway! Thank you! I would love the Sugar and Spice Cookie Baking Party kit so the whole family could bake cookies together! I LOVE the secret agent man party box! Very cool. My 8 year old would love it. You`d spend that much on a party anyways, might as well get a great one! Dinosaur Dig for sure! My little guy would totally love this! Wine and Cheese party to feel like an adult again. I just love the Oooo La La Let's Spa kit! Great giveaway! I hope I win! I'll have to go with the Come into my Web Halloween Party set! Halloween is my favorite holiday and that set is adorable! Thanks so much for the chance! I love the bridal shower set!! I really love the Tweens Luau Party I know my daughter would love it. Very cool site!! I have to say the featured set is definately my favourite but, I think my dtr would enjoy the safari kids birthday party pack – especially since she is learning her animals and roars like a lion – so adorable!!! I like the New Year's Eve party set too. I like the New Year's Eve party set, looks really fun. My nephew who wants to be a budding chef would totally love one of these baking sets. how fun would it be to have a Pineapples in Paradise Luau Party in the middle of Winter. I love this. I love the Christmas cookie baking set for one. This would be great for my daughter. I like the bridal set. So cute! I like the Wine and Cheese Party set! what great ideas they have! I really liek the cookie one, but if I had to choose another I'd pick the Itza My Pizza one. Since it's the end of a long work day… I'm going to go with the Martini Time gift box. If only one would arrive at my door stat! I would love the Sugar 'n Spice Cookie Baking Party! So fun! I like the Pretty in Pink Baby Shower Kit! I'd love the All About Bugs Nature Party. My son would be so into that! Great idea. The Ahoy Mates Pirate Gift Box looks cool! What a great idea! I like the butterfly princess party set! Ooh, I like the 008 Secret Agent box. Seems like a lot of fun! I can't pick just one!! Love them all, butterfly princess, la tea da – all of them would be great. But love the one you have for a giveaway, what a cool idea!! I love their party packs. They look great. I love the Butterfly Princess Party. I know my daughter would really like this. I like the Unforgettable Bridal shower. I love the Baby's First Tooth and First Curl Holder, it would be perfect for my niece. This would be awesome to win. my 2yr old daughter loves to help me in the kitchen so this would be fun! OOOH I love the seasonal gift sets they are so cute and my daughter would love this, she loves to bake. I love the La Tea Da tea party set. Gorgeous, such a great idea! I like the Butterfly Princess Party. Looks like lots of fun, my kids would love it. cdziuba@aol.com I like the "Unforgettable" set. I like the posh and pampered bridal shower set. What a neat idea! Such wonderful ideas at Posh Party Box and if I had to pick just one of my favourites it would be the Amaryllis Holiday Large Crystal Ornament.